You must pay attention to the seeds. Most seed packets have information regarding the seed’s germination requirements. If you’re like me your seed catalogs have started to arrive in droves. Any one of these catalogs should have a germination table, and if you can’t find one just like anything else you can always Google it. Now that you’ve selected your seeds it’s time to sow. As I did my research I decided on the re-use, recycle method of using old plastic containers. Whether it’s a plastic milk jug, or old Chinese delivery container, it’ll be perfect for winter sowing. Fill with 3-4" of regular potting soil, not soilless mixture. And there you have it! I can’t wait to get going, I’ll be sure to keep track of the progress (if there is any) and post an update in the spring. For a little luck I think I’ll have my little girl help me sow, I think it’ll be a fun activity for her as well!! 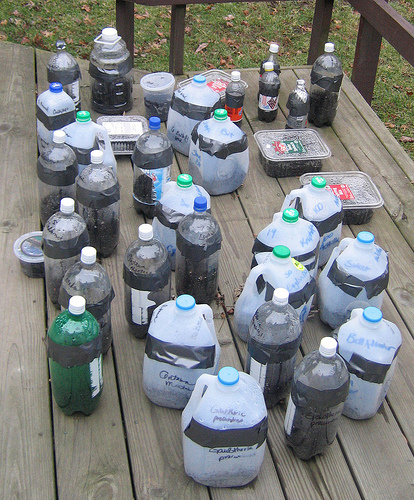 This entry was posted in Gardening Tips, Homeowner, Indoor Gardening, Landscaping, Uncategorized and tagged Garden, Garden hose, garden hose sprayer, Germination, Google, kink free garden hose, lightweight garden hose, Perfect Garden Hose, Plant, Seed, Seedling, Sowing, TUFF GUARD The Perfect Garden Hose, Upstate New York. Bookmark the permalink.